The gift of a flower has so many emotions attached to it. In gratitude,in happiness, in sorrow, in friendship, in Love. I remember one cold day in Winter, December 28 to be precise, I had spent the day working outside, harvesting radicchio ready for market. As I didn’t have time to get anything for my husband as it’s the day of his birthday, I picked a bunch of red rosettes of radicchio and set the dinner table. It looked and meant much more to me than ruffled radicchio leaves, this vegetable that survives our cold winter weather, had created a whole new warm atmosphere to my dinner table. Red rosettes of my affection. Passing the vegetable patch earlier this week, my sister in law did the same thing. On her way to give me well wishes for another passing birthday, she picked three zucchini flowers in full bloom. 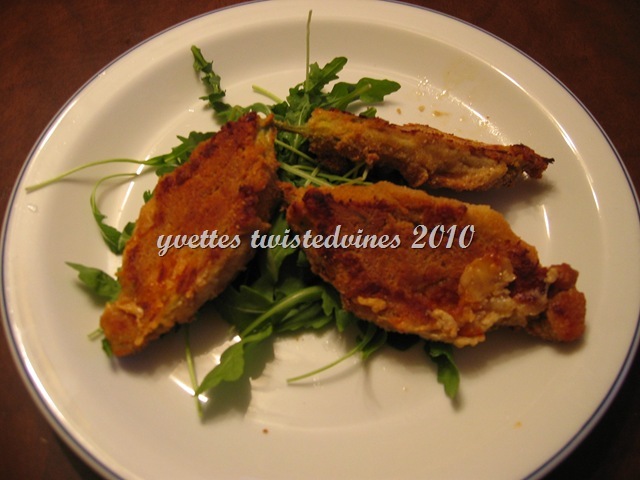 She then added her recipe for stuffed zucchini flowers. Even after putting them in a vase of water, without sunlight they close straight away…so it was obvious that the result was to try her recipe. 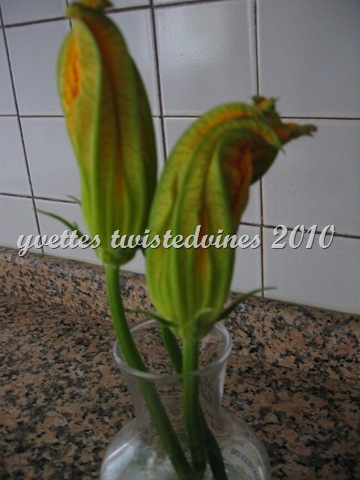 Delicately open zucchini flower and take out the centre. Slicing the mozzarella into medium slices, wind the anchovies around the slices. 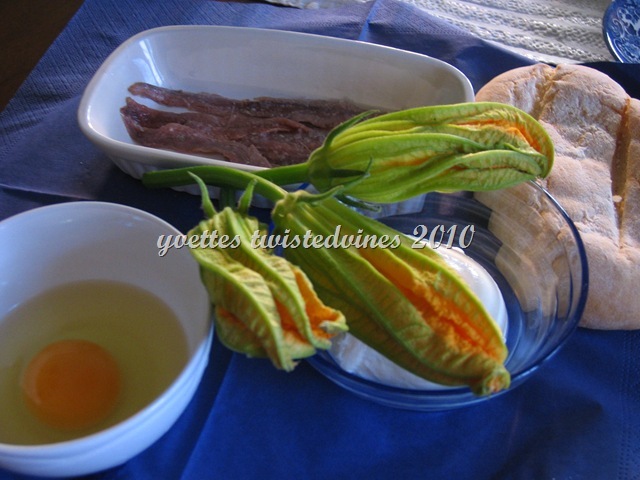 Then place inside the centre of the zucchini flower. Make breadcrumbs blending one or two stale bread rolls, you need about a cup. Lightly beat 2 eggs. 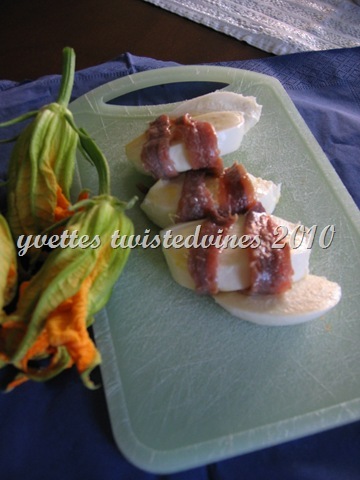 The stuffed zucchini flowers are then double coated. Firstly in egg then the breadcrumbs. Repeat. Place on oven proof paper on a tray. Here’s where you have the option to fry or bake. I always go for the second option, place in a medium temperature oven and bake for 15/20 minutes. Serve hot, but be warned be careful of the mozzarella. A mouthwatering treat. Neat gifts from the heart and nature’s bounty. Good call. 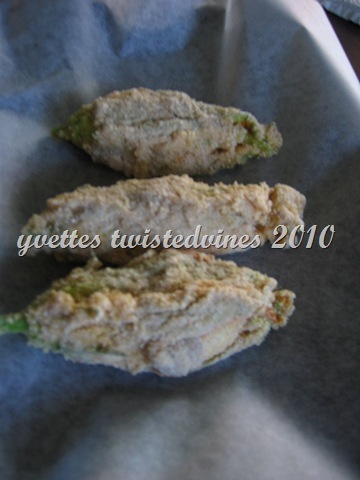 For what it’s worth, I made my first fried zucchini blossoms last week. They were very good. I stuffed mine with shredded cheddar cheese. It’s what I had on hand, but I like your recipe — a lot! Thanks for sharing. Thanks for dropping by.I think these delicate flowers stuffed with any cheese would be delicious!I found a recipe using even blue vein cheese! I’m gonna try this zucchini blooms recipe as soon as I have the guts to turn the stove on, don’t know about you but we’re melting here! Hi, yes the days are getting hotter, roll on Summer!, and Summer vacation days! Thanks for dropping by! I totally agree..a small gesture with a big impact! Lovely thoughts and a timely recipe for my zucchini plants have just started to bloom!